Real limestone and synthetic limestone surfaces are usually very attractive to mildew, mold and carbon build up. These pollutants will attach themselves to the natural stone and cause severe darkening. Limestone that is white or tan can easily turn into a dark black. 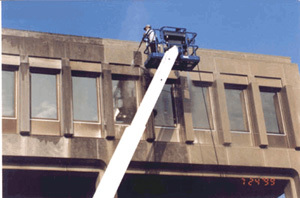 The results of having limestone cleaned are usually very dramatic. We utilize our hot water pressure washing system first and if the limestone is not cleaned 100% we then will apply a cleaning agent. We always identify what type of stain is present before deciding on which detergent to use.